Still did a quick analysis on the local futures, to record down some potential significant changes in the sentiment on both instruments today. After days of consolidation within converging lines, in what seems like an ascending triangle, or maybe a flag, late trading today saw price seems to have broken down below the congestion area (I'm not sure what form it is, yet...:p), closing on the weak support of 1,623. We'll see if tomorrow we can see some continuation of the downward movement, to confirm a breakout. Short on first retracement shall the downward movement is confirmed. This may well be the start towards the 1,587 support, as illustrated by the hand-drafted wave counts in my previous post. It did a wonderful reversal right near the Wave1 low of 2,476 (intraday high 2,477), closed in a Shooting Star. Its a bearish signal, especially so as we are at a rebound high within a primary downtrend on CPO. Woah!! 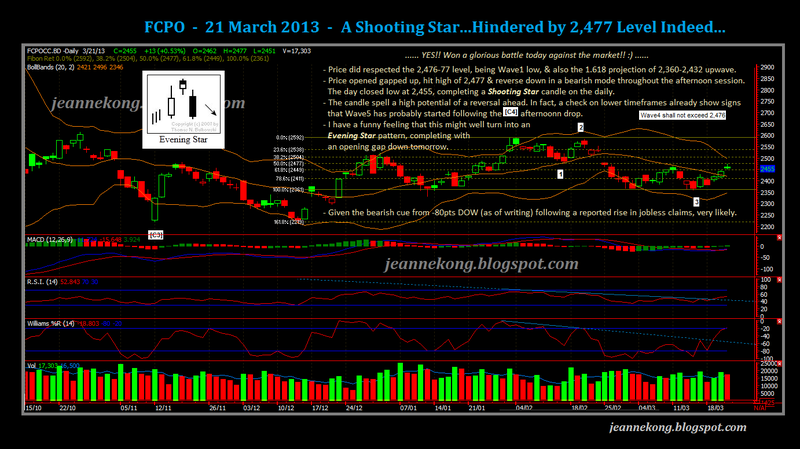 CPO totally nullify that shooting star yesterday by closing at 2,494 high today. Late afternoon trading saw price did a big U-turn, shooting past the 2,476-85 resistance region, & managed to partially cover the Feb25 gap, hitting an intraday high of 2,503. Now that the Wave1 low of 2,476 violated, Wave4 should have 'evolved' into some other variations, which I have yet to figure out. Anyway, price is heavily overbought at current high. With immediate resistance overhead at 2,504 (61.8% retracement of the 2,593-2,360 down-wave), which it failed to overcome in its late bullish spike just now. Meanwhile, the 2,476-85 region shall now turned a strong support. We will see how it goes from here on Monday. 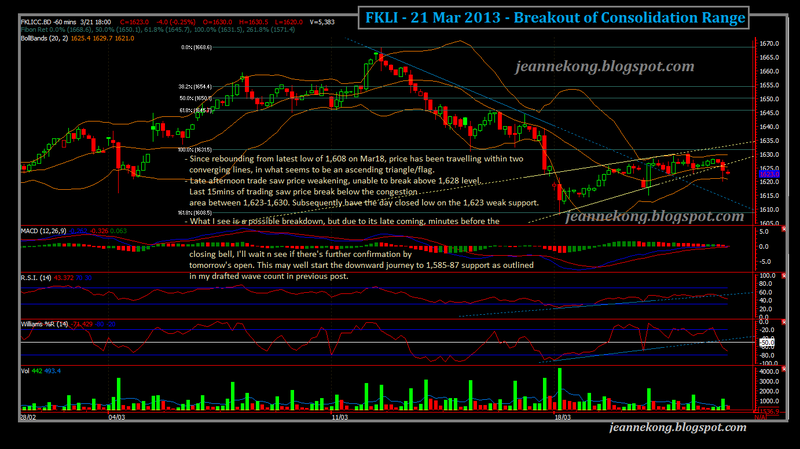 Price open low but managed to rebound in what seems like a first retracement of the drop from latest high of 1,630.5. Retracement touched 1,628 high & reversed back quickly to 1,621-23 level. A little consolidation within that range, before closing slightly higher at 1,624.5. We might have our first retracement high at 1,628, based on the momentum indicators. Nonetheless, the rather high close smell a little bit like bulls are still in. Im watching 1,628-30 level, we might well have another touch there on Monday, or may not. As long as the price stays outside the previous converging lines plotted, I will maintain a short-at-rebound-high bias. 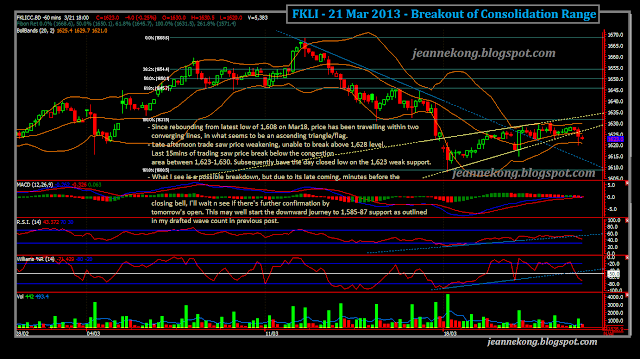 Pretty surprising close on both FKLI & FCPO for the week, I shall say. Ya .. Smell some roses , do some yoga and whatever u can do I relax and release some endorphins.